Alexina, Richard W., and Charles Bascom Harris, Jr. 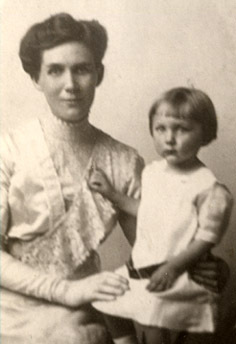 Comments: Alexina (Harrison) Harris holds her young son, Richard Wheat Harris, in a circa 1914 photo. 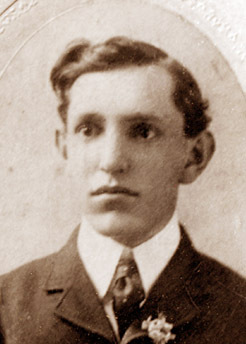 At right is a photo of her husband, Charles Bascom Harris, Jr., as a teenager at the turn of the century. Charles was the proprietor of 'C.B. Harris and Co,' a Scottsville business on Main Street that sold mens' clothing. His store was located in the old Harris building where his grandfather, Miletus, ran a general mercantile store in 1860. Around 1880, Charles' father and uncle continued the family business there, turning over the clothing portion to Charles in 1912. Born on July 21, 1883, Charles was the son of Charles Bascom Harris, Sr., and Helen Goddin (Crafton) Harris of Scottsville. Besides clerking in his father's store, Charles loved baseball and playing several brass instruments in the Scottsville marching band. Charles often ate lunch at Betty Harrison's boarding house on Valley Street (now the office portion of Thacker Brothers Funeral Home). He was the best friend of Betty's son, Richard W. Harrison, and eventually fell in love with Alexina Lee Harrison, her daughter. Alexina and Charles married on October 2, 1912, at St. Johns Episcopal Church in Scottsville. Their wedding was the first ceremony held in St. Johns in more than thirty years. After a Canadian wedding trip, Alexina and Charles returned to Scottsville and their clothing business. Charles and Alexina built a frame home on several acres at one corner of his parents' Fairview property and called their home 'Richarden' in memory of Alexina's deceased brother, Richard. Richard W. Harrison died in August 1913 of gunshot wounds while working as the night telegrapher at Scottsville's C&O Depot; his murder was never solved. Charles' and Alexina's first child, Richard Wheat Harris, was born just 20 days after his uncle's death and was named Richard in his uncle's honor. The C.B. Harrises were the parents of five children: Richard Wheat (1913-1990), Elizabeth Goddin, Margaret Lee (1920-1981), Katherine Crafton, and Barbara May Harris (1926-1991). As a twelve-year old, Charles B. Harris, Jr., was an avid collector of birds' eggs. In total, he collected over 65 different eggs of birds that nested around Scottsville. Two of the rarest include those of the black vulture and the wild turkey. After Charles died in 1959, his collection was kept by his daughters until May 22, 1994, when they donated it to Scottsville Museum. 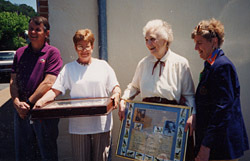 Shown left to right in the right photo are: Jack Hamner and Agnes Johnson of Scottsville Museum, Elizabeth Goddin (Harris) Brown and Katherine Crafton (Harris) Rice. 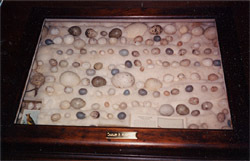 This birds egg collection remains a most popular Scottsville Museum exhibit with all ages. These photos are from the Katherine Ellis collection. Katherine resides in Scottsville and is the granddaughter of Charles Bascom Harris, Sr., and Helen (Crafton) Harris.